What is radiofrequency (RF) energy? Why is RF energy important? Can RF energy affect your health? How does the Government of Canada protect you? What amount of RF exposure is considered safe? Are the Canadian limits the same for all wireless devices and antenna installations? RF energy, also referred to as “RF emission,” “RF wave” or “RF field,” is one form of electromagnetic energy that is part of the electromagnetic spectrum. There are both natural and human-made sources of electromagnetic energy. Two types of energy are shown on the electromagnetic spectrum: non-ionizing and ionizing. Non-ionizing energy is electromagnetic energy that does not break down the bonds between atoms and molecules, which means it does not break down chemical bonds within cells and tissues. Examples of non-ionizing energy include visible light and RF energy used in wireless communication. Ionizing energy is electromagnetic energy that may have enough energy to break down the bonds between atoms and molecules. Examples of ionizing energy include X-rays and gamma rays, which are both used in some medical treatments under medical supervision. Electromagnetic spectrum is the range of frequencies produced by all sources of electromagnetic energy. 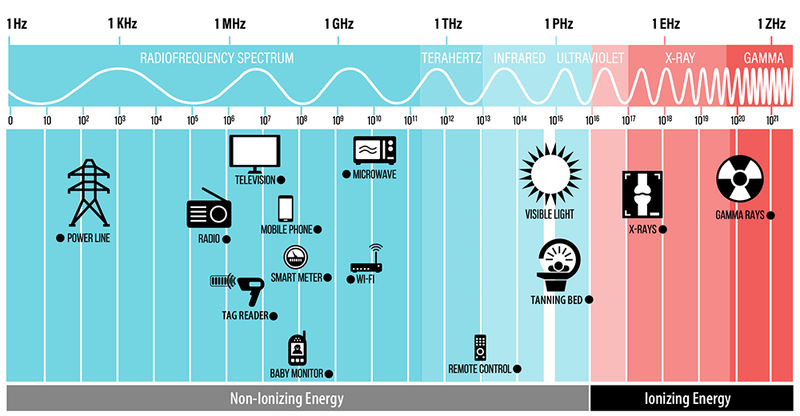 The diagram illustrates where common equipment operates in a specific frequency range starting from a powerline, moving through radiofrequency spectrum to phones and ending with X-rays and gamma rays. Almost every area of your day-to-day life uses RF energy. It delivers your morning news through wireless services such as broadcasting (AM and FM radio, TV); lets you place your coffee order through your cell phone; protects you by providing communication for emergency services (police, fire, ambulance); and keeps you connected through the operation of wireless consumer devices such as Wi-Fi, baby monitors and cordless phones. Although we most often think of RF energy as coming from modern-day technologies, exposure to electromagnetic fields in everyday life is not new. Human-made sources of electromagnetic fields have increased in the past century with the development of technology and radio communications, but natural electromagnetic energy has always been around. Scientists have been studying the health effects of RF energy for decades. Many international studies on this issue have concluded that effects associated with exposure to RF energy depend on the frequency range. For example, higher frequency ranges may result in tissue heating, while short-term exposure from lower frequency ranges may produce nerve stimulation like a tingling sensation. The Government of Canada has established RF exposure limits to prevent these effects from occurring. The Government of Canada is committed to protecting the health and safety of Canadians from environmental risks, including those posed by overexposure to RF energy. 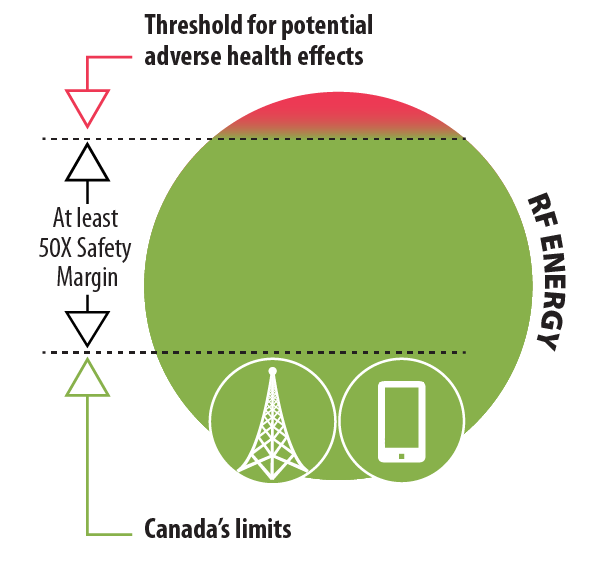 Canada’s approach to RF exposure safety is among the most stringent in the world. The Government of Canada continuously monitors the research and scientific literature on the health effects of RF exposure to ensure that Canadian limits are consistent with the current scientific consensus to prevent potential adverse health effects. Health Canada's guidelines on safe human exposure to RF energy, also referred to as Safety Code 6, present recommended exposure limits. These limits are set well below the levels of all known potential adverse health effects and provide protection for all age groups, including children, on a continuous basis (24 hours a day, seven days a week). This means that if anyone, including a small child, was exposed to RF energy from multiple sources within the Safety Code 6 limits for 24 hours a day, 365 days a year, there would be no adverse health effects. Health Canada continuously monitors the research on this issue and revises its recommendations as needed to continue to provide protection for all Canadians. Health Canada also ensures that RF exposure limits are consistent with science-based limits used in other parts of the world (e.g. the United States, the European Union, Japan, Australia and New Zealand). 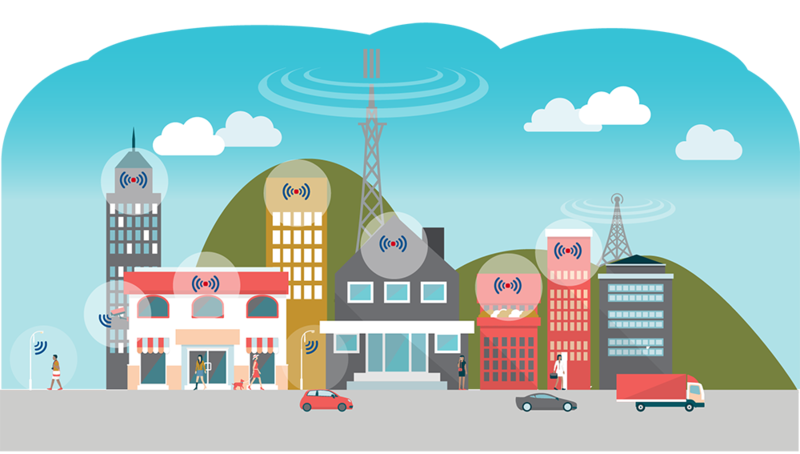 Innovation, Science and Economic Development Canada (ISED) has adopted Health Canada’s Safety Code 6 as the Canadian RF exposure limits for wireless devices and their associated infrastructure. 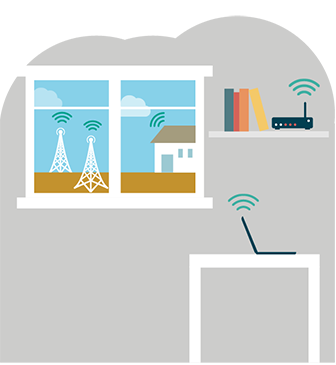 ISED’s regulatory framework, including market surveillance, compliance audits and enforcement procedures, provides safeguards to protect Canadians against overexposure from wireless devices and antenna installations. Wireless devices must meet the RF exposure requirements at all times and be certified before they can be sold in Canada. Anyone who manufactures, imports, distributes, sells or leases wireless devices in Canada must comply with ISED’s regulations. ISED also maintains a market surveillance program, which audits and evaluates a sampling of wireless devices currently on the Canadian market on an ongoing basis. The market surveillance program helps to ensure that wireless devices available to Canadians continue to meet the RF exposure requirements. Antenna installations must also meet RF exposure requirements. ISED routinely audits these installations to make sure they comply with Safety Code 6 limits. The Canadian limits incorporate a safety margin of at least 50-fold from the threshold for possible adverse health effects. Exposure to RF energy below the Canadian limits is safe. The limits are set far below the threshold (at least 50-fold safety margin) for all known established adverse health effects. Health Canada has incorporated several tiers of precaution into the limits to ensure safety, including a conservative threshold for the occurrence of adverse health effects, the use of worst-case exposure scenarios and an additional safety margin beyond the threshold. The limits for wireless devices (e.g. cell phones, Wi-Fi enabled devices and other consumer portable devices) and antenna installations on towers are different. The limits established for wireless devices are known as localized limits. Since these devices are used within a few millimetres from the body or on the body, only a localized portion of the body (head, torso, limbs) is exposed to the RF energy. The limits established for antenna installations are known as whole body limits. Antenna installations on towers are generally found at a distance from a person’s body, which results in the entire body being exposed to RF energy. Therefore, the applicable limits are different. Nerve stimulation is a tingling sensation resulting from exposure to RF energy levels well above the Canadian limits. Specific Absorption Rate (SAR) is the rate of RF energy absorbed in the body (in a volume of tissue) when a wireless device is in close proximity. SAR is expressed in units of watts per kilogram (W/kg). ISED requires that all wireless devices sold in Canada comply with established SAR limits. Power density is the amount of electromagnetic energy in a given area, typically expressed in units of watts per square metre (W/m2). Wireless devices used close to the body are referred to as portables or wearables. These devices are tested against different limits depending on their operating frequency, which may include more than one type of evaluation. Below 10 MHz: devices are tested against electric and magnetic field strength limits to avoid nerve stimulation. Examples of devices that fall under this category are wireless charging devices, metal detectors, electronic cards, tag readers and anti-shoplifting detector panels installed at doors of stores. Between 100 kHz and 6 GHz: devices are tested against Specific Absorption Rate (SAR) limits to avoid tissue heating. Most portables and wearables currently available in Canada, such as cell phones, tablets and smart watches, fall under this category. Above 6 GHz: devices are tested against power density limits to avoid tissue heating. Very few portable and wearable devices fall under this category, but these types of devices will increase as 5G technology is deployed in Canada. For more information about the Canadian limits, refer to RSS-102, Radio Frequency (RF) Exposure Compliance of Radiocommunication Apparatus (All Frequency Bands) or Safety Code 6. Want to learn more about SAR? Canada’s SAR limits are measured against absorption levels to the head, torso and limbs. For more information about the SAR limits, refer to RSS-102, Radio Frequency (RF) Exposure Compliance of Radiocommunication Apparatus (All Frequency Bands) or Safety Code 6. 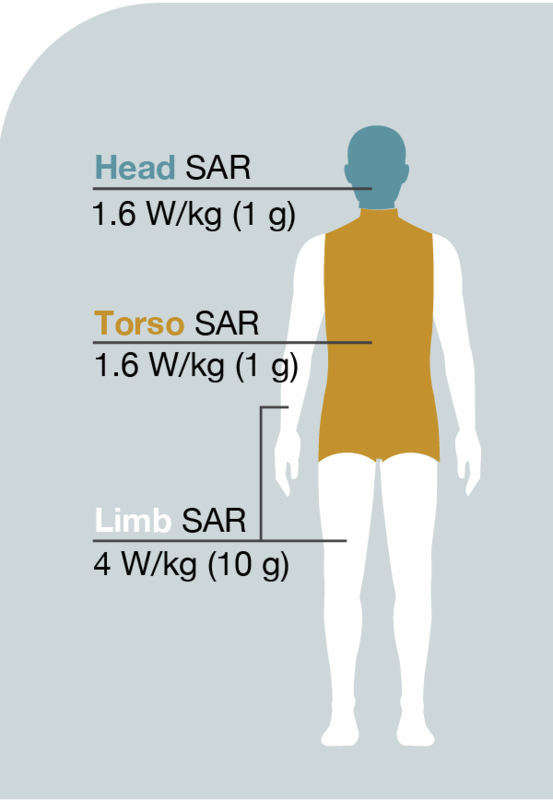 This figure shows Canada’s SAR limits for different parts of the human body. The head and torso have a SAR limit of 1.6 W/kg in 1g of tissue and the limbs have a SAR limit of 4 W/kg in 10 g of tissue. Are SAR limits the same around the world? Canada and the United States have the same SAR limits. However, other countries, such as Australia and those in the European Union, have adopted limits recommended by the International Commission on Non-Ionizing Radiation Protection's (ICNIRP) guidelines, which are less strict. How are SAR measurements determined? A specialized laboratory measurement system is required to perform SAR measurements. A trained professional is shown using a specialized laboratory SAR measurement system. It includes a robot, a probe, phantoms and a computer. The measurement system includes a precision robot, device positioner, probe, sensor, specialized computer software and phantoms. Phantoms are specially designed containers, which are filled with a liquid that simulates the properties of the human body. Different phantoms are used to test the impact on each type of body part: head, torso and limbs for which SAR limits are defined. The wireless device is positioned directly against a simulated human head or at a separation distance (compliance distance) of a simulated human body (torso). The wireless device is switched on to transmit continuously at full power. 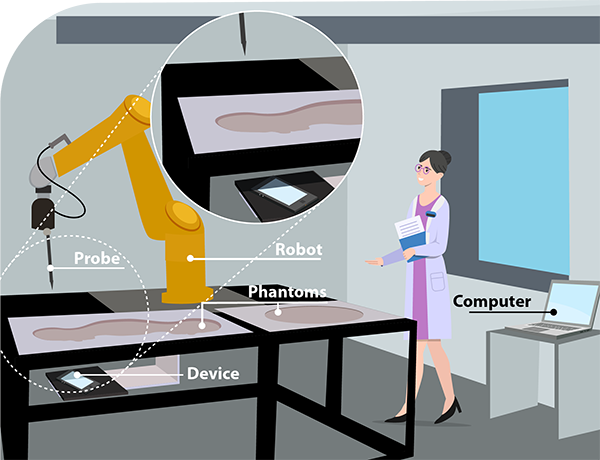 The precision robot moves a probe inside the simulated head or torso to find the spot with the highest RF energy produced by the wireless device. The data is collected and converted into a SAR (W/kg) value. The test is repeated for different orientations, configurations, operating frequencies and technologies featured by the wireless device. The maximum level measured is recorded as the SAR value for the head, torso or limb. The required SAR tests for modern wireless devices such as smartphones can take between several weeks and several months. Are wireless devices with lower SAR values considered safer? No. As long as the device’s SAR value is below the Canadian limits, a lower SAR value does not indicate an increase in safety for the user. Different portable/wearable devices will have different SAR values based on their design; however, all must meet Canada’s SAR limits, which are well below any level that could cause adverse health effects. Does the SAR level of a cell phone change when in use? Yes. When cell phones or similar wireless devices are tested, they are switched on to transmit at full power for the duration of the test. In reality, cell phones operate at much lower power levels, to preserve battery life, maximize call time and optimize network performance. In normal day-to-day use, a cell phone produces much lower SAR levels than those measured during laboratory testing. How should I be using my cell phone or other wireless devices? What does compliance distance mean? ISED requires cell phone manufacturers and other wireless devices to provide information to users on the minimum compliance distance to maintain between the cell phone or wireless product and the body (torso). This distance is usually between 0 mm and 15 mm. This compliance distance often represents the distance created by a phone holder or clothing. This compliance distance allows for better signal reception because the cell phone is used away from the body and meets the SAR requirements. If the specified compliance distance is not respected by the user, it is possible that the cell phone is being used in a non-compliant way. However, this does not compromise safety as the Canadian limits have safety margins of at least 50-fold. Furthermore, during SAR testing, cell phones are switched on to transmit at full power, which represents a worst-case scenario in terms of exposure to RF energy. Cell phones can always be used directly against the ear without any compliance distance. This is because the cell phone is designed to keep the antenna far enough away from the head to meet SAR limits and to operate most efficiently. How can I maintain the recommended minimum compliance distance? You can choose an accessory such as a case, belt clip, or holster approved by the manufacturer of the wireless device. Am I at risk if I place my cell phone directly in my pocket and forget about the recommended compliance distance? Clothing, cell phone covers, belt clips or holsters provide a separation for wireless devices. However, it is important to check the user manual for the minimum compliance distance. ISED’s technical standards for wireless device safety testing are among the most stringent in the world. For example, cell phones are tested at full power for the duration of the test, whereas during normal day-to-day use cell phones operate at much lower power levels. As well, the Canadian limits incorporate a safety margin of at least 50-fold from the threshold for possible adverse health effects. Therefore, cell phones are still considered safe when carried in your pocket. Where can I find SAR values and compliance distance for my wireless devices? When you select the model number of your product in the Radio Equipment List search tool, the applicable SAR value or compliance distance for your certified wireless product will be displayed in the appropriate section under RF Exposure Results. Devices such as Wi-Fi routers, baby monitors, smart meters, etc. are not evaluated for SAR, since they are intended to be used away from the body (more than 20 cm). The RF energy levels generated by these devices are determined and compared to the Canadian limits. 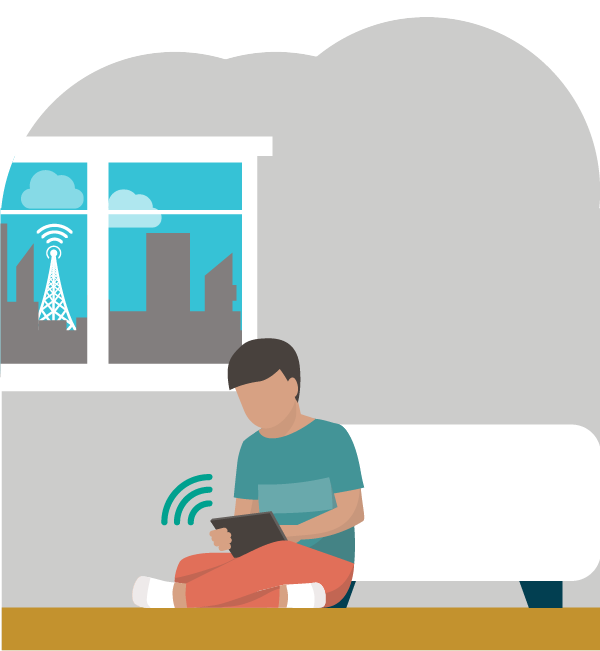 ISED conducted an extensive study to measure RF exposure levels from multiple Wi-Fi routers and Wi-Fi-enabled laptops in a simulated classroom setting. The study confirmed that in environments such as schools, workplaces, and public and private spaces, the RF exposure levels from these wireless devices was significantly below the Canadian limits. Want to learn more about Canada’s limits? Canada’s limits for devices meant to be used far from the body are specified in to RSS-102, Radio Frequency (RF) Exposure Compliance of Radiocommunication Apparatus (All Frequency Bands) or Safety Code 6. Are the limits the same around the world? Canada's limits are consistent with the science-based limits used in other parts of the world (e.g. the United States, the European Union, Japan, Australia and New Zealand) and provide protection against all known adverse health effects resulting from RF exposure. What do I need to know when using a device that is used far from the body? What is compliance distance? 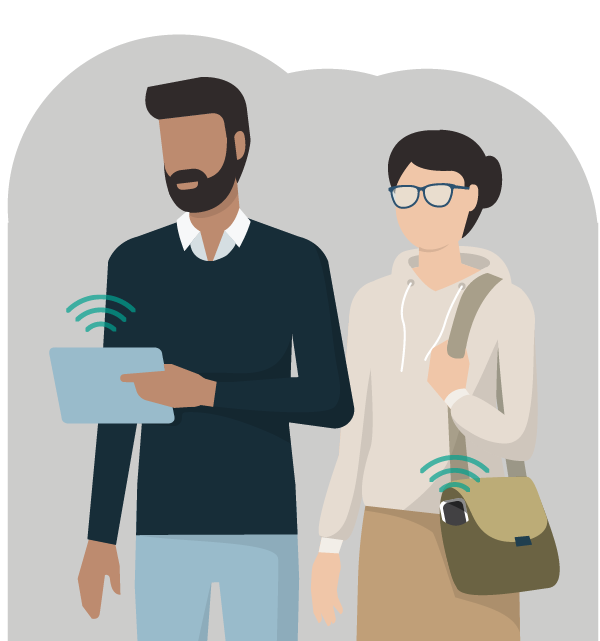 ISED requires manufacturers of wireless devices to provide information to users on the minimum compliance distance to maintain between the wireless product and individuals. What if I forget about the minimum separation listed in the user guide? Am I at risk? A person is sitting at a desk with a computer and a router placed on a shelf at a compliance of at least 20 cm. 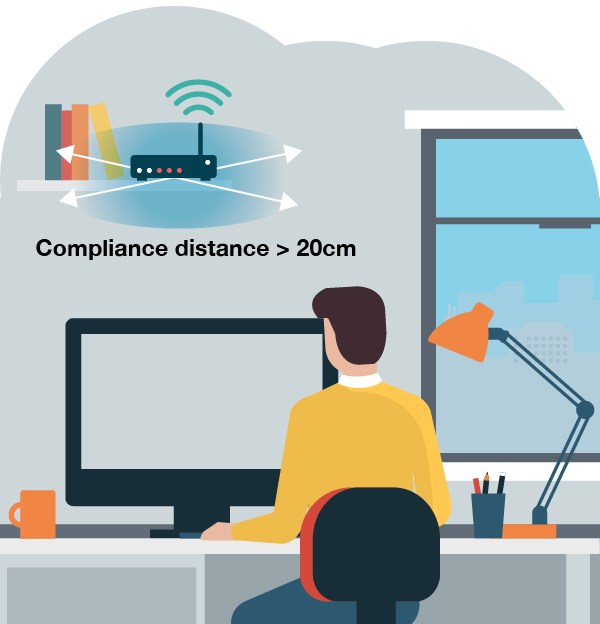 The compliance distance provided for typical wireless devices is usually very low compared to real-life installations. 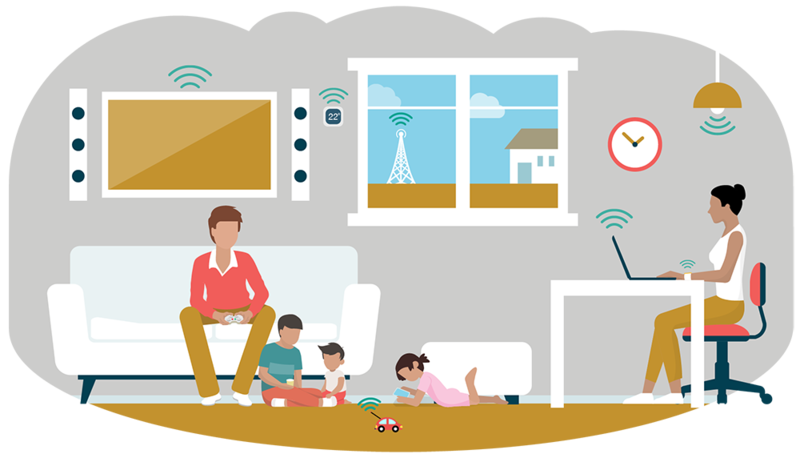 For instance, a compliance distance of a few hundred millimetres may be reported for a wireless (Wi-Fi) router; however, for home installation a person is typically located further away from the router. 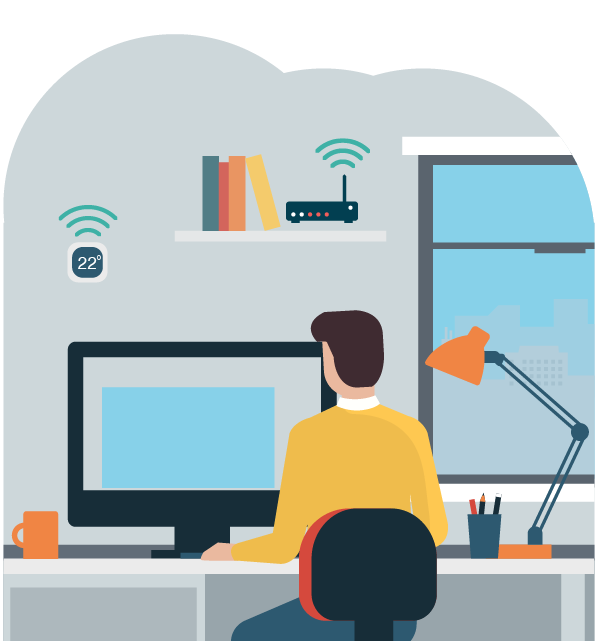 The compliance distance for wireless devices far from the body is determined by having the device turned on at maximum power for continuous transmission. During normal day-to-day use, they operate at much lower power levels. This compliance distance represents the worst-case scenario. As well, the Canadian limits provide a safety margin of at least 50-fold against the occurrence of all established adverse health effects associated with exposure to RF energy. Therefore, wireless devices used far from the body would still be safe when a person is closer than the minimum compliance distance found in the user manual. Canadians want faster and more accessible service so they can reliably use their wireless devices to keep in touch with loved ones and stay informed. Businesses, emergency services and air navigation systems also depend on radiocommunication and wireless services 24 hours a day. Newer technological advancements, such as 5G, are being designed to meet current and future demands including the very large growth in data and connectivity of today’s modern society, the Internet of things (IoT) with its ubiquity of connected devices, and tomorrow’s innovations. All these services require towers and antenna installations located in the right places. For more information about towers, visit Facts about towers. ISED requires that all antenna systems meet Canadian limits on the amount of RF energy that can be present in areas to which the public has access. This means complying with the regulatory requirements and process established in the antenna siting procedures, CPC-2-0-03, Radiocommunication and Broadcasting Antenna Systems before an installation is approved. Once antenna installations are built, operators need to ensure their installations comply with the Canadian limits at all times as a condition of their licence. To monitor ongoing compliance, ISED conducts various antenna installations audit programs. What are Canada’s limits for antenna installations? Canada’s limits for antenna installations come from Health Canada’s Safety Code 6. This figure shows the Canadian limits that incorporate a safety margin of at least 50-fold from the threshold for possible adverse health effects. How is the safety of antenna installations evaluated? Specialized software can also perform analyses (theoretical predictions) of the RF energy at antenna installations. These analyses performed by the antenna installations operators are provided to ISED to demonstrate compliance with the Canadian limits. Which factors influence exposure levels? The signal power plays a significant role on the RF exposure levels generated by the antenna installation. The lower the operating power of an antenna installation, the lower the RF exposure levels will be. Furthermore, as the distance increases from the antenna installation, the RF energy diminishes very quickly. In other words, RF exposure levels will be lower farther away from an antenna installation. What do I need to know to ensure RF exposure safety near antenna installations? Certain high-power antenna installations, typically found away from populated areas or in areas difficult to access, require signage and physical barriers such as fences. The presence of these access control mechanisms is to restrict access and inform the public. 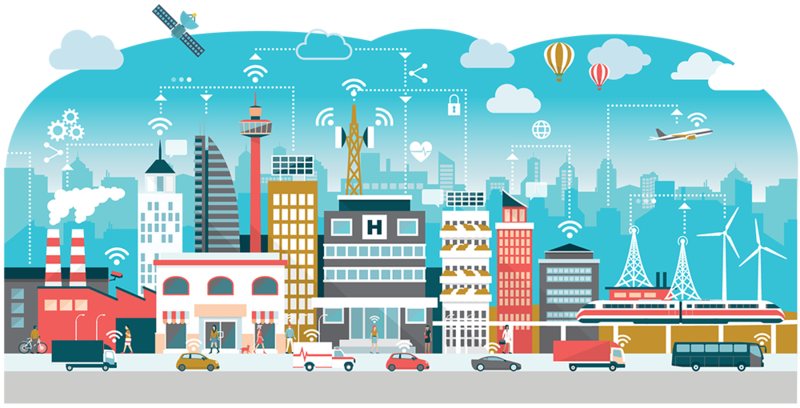 Small cells are physically smaller radio installations that can complement larger radio installations to improve coverage, add capacity, and support new services and user experiences. There are various types of small cell with varying power ranges. The smallest are for indoor use (sometimes referred to as femtocells) operating on power levels similar to Wi-Fi routers. The largest are for outdoor use and typically consist of a small equipment cabinet and small antennas. The largest are often located on existing facilities like street lights, power utility poles and buildings. Small cells must comply with the same limits that apply to other antenna installations. 5G is the 5th generation of wireless technology, a significant evolution of today’s 4G LTE wireless networks. 5G will provide the infrastructure to allow for more data and connectivity, the Internet of things with billions of connected devices, and tomorrow’s innovations in various fields such as healthcare, public safety, transportation, agriculture, and smart cities. 5G will operate in both the lower frequency spectrum (below 6 GHz) as well as at higher frequencies called millimetre wave spectrum (above 6 GHz). 5G should not be confused with Wi-Fi operated in the 5 GHz frequency band as they are different wireless technologies. A city with multiple 5G networks is shown. 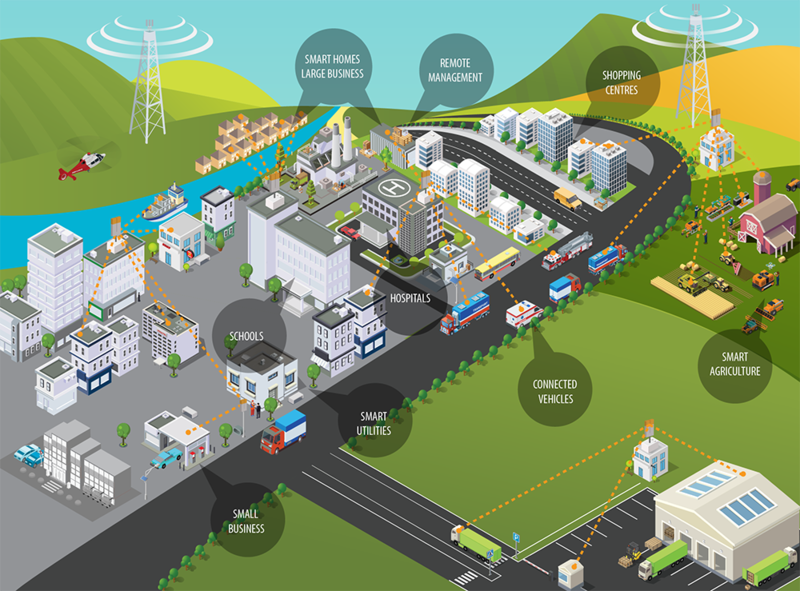 Possible services enabled by the 5G networks include smart homes, smart agriculture, connected vehicles, remote management, etc. The current Canadian limits already cover the frequency ranges that will be used by 5G devices and antenna installations. Similar to current wireless devices and installations, 5G devices will need to meet RF exposure requirements before they can be sold in Canada. Antenna systems operators using 5G technology will continue to have the same RF exposure compliance obligations. Furthermore, compliance with RF exposure requirements will continue to be an ongoing obligation.